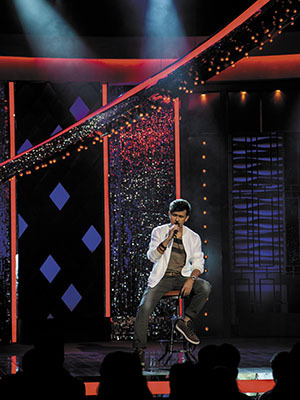 Sonu Nigam was always meant for the stage. Even his four-year-self knew that, which is why he started bawling while watching his father Agam Kumar Nigam perform in the late ’70s. “He was singing ‘Kya hua tera vaada…’ [a song sung by the late Mohammed Rafi—a legend Nigam would repeatedly be compared with over the years—in Hum Kisise Kum Nahin] and I was desperate to join him,” recalls the playback singer. Seated with him in the audience was his mother who relented eventually. “I sang that song with him,” says Nigam, now 42, every detail fresh in his mind. The stage and Nigam have been inseparable since. “When I am on the stage, I feel like there is nobody. When I get off, I am just a bundle of energy… the high is so great that I find it tough to get back to [being] normal,” he says. Regarded as one of the most versatile and soulful singers since his debut in the early 1990s, Nigam’s voice has enthralled people across age groups and geographies. Though he has consciously cut down on playback over the last few years, the few songs he does, like ‘Love is a waste of time’ (PK, 2014) and ‘Sapna jahan’ (Brothers, 2015), become chartbusters. “Sonu is a combination of extreme talent, hard work and intelligence,” says Shantanu Moitra, music director of films such as Parineeta (2002) and PK. The confidence in his talent perhaps helps Nigam stay fearless, whether it’s on the issue of music companies giving royalty to singers or posting a series of tweets defending controversial godwoman Radhe Maa in August 2015. Even so, his fans were unprepared for his unexpected decision in 2006 to ‘retire’ from playback signing. Then 33, he was at the peak of his career, having collaborated with the likes of AR Rahman, Anu Malik, Ismail Darbar and Nadeem-Shravan on some of the biggest hits in Indian cinema. But Nigam says it was a time when he re-evaluated what success meant to him. On an average, Nigam performs at 80-90 concerts across the world in a calendar year, for a crowd ranging from anywhere between 500 and 50,000 people. And despite his skills and stature, he experiences the same nervousness and anxiety as any layman. It was particularly difficult in the months preceding his mother’s death [in May 2013]. He says he was always crying, which led to a perpetual cold. “I’d be in no condition to perform. Before every concert, I’d wish I didn’t have to perform, but once I was on stage, I would forget everything,” he says. The conversation gets interrupted as Filmcity is swarming with people and a distance of about 100 feet from Nigam’s trailer van to his 12-seater Toyota HiAce van takes more than 15 minutes to walk because the singer is hounded by fans. Once inside, he gets a breather, but only momentarily. He is immediately on the phone with his concert promoters first and then his wife. “I am leaving for The Netherlands and London tomorrow and right now, I am really late for my wife’s fashion show,” he says. The concerts, he tells us, are a part of the ‘Klose to My Heart’ show that he designed in 2012. “This was the first symphony tour for a Bollywood singer. We opened in the US and had 40 musicians. Last year, I designed another show called ‘Klose to My Soul’ that has more musicians and dancers. I keep pushing myself to better the quality of our shows,” says Nigam. About a decade ago, when most Bollywood singers performed with makeshift musicians, Sonu decided to form a fixed band. “I got a jazz drummer, jazz base guitarist and a lead guitarist called Elvis. I was the first to get a designated sound engineer and we had a rider that specified sound and light equipment that were to be used for the show. We started designing a concert rather than just going out and singing a bunch of songs,” he says. But Nigam, who has also hosted reality shows and acted in a few movies, knows that talent is not enough. To survive in an industry where reality TV shows throw up new singers every few months, he has had to reinvent himself constantly. “Initially when he had started his career, he was bombarded with criticism that he was a Mohammed Rafi clone. He understood that he needed to develop his own individual sound. He completely re-learnt how to use his vocal muscles, air intake and changed how he used the mike,” says music director Moitra. Music is an integral part of his being and, yet, Nigam thinks he doesn’t appreciate it as much as he should. “It’s like breathing… you know how important it is for your life, but you don’t think about it every time you draw a breath,” he says. However, when he wants to unwind, the singer prefers silence. And that’s one of the reasons he says he wants to move out of Mumbai. Some years ago, Nigam found the perfect place for his dream farmhouse, a few hundred kilometres outside Mumbai. He started building a home where he could do yoga in peace, play badminton with his son Nevaan and farm. “My favourite channel these days is DD Kisan,” he says with a laugh. The singer is learning all that he can about organic farming and animal husbandry. “This has been a long cherished dream. I see myself spending the rest of my days on that farm, which should be ready by year-end. It would have everything I need—a movie theatre, library, swimming pool, a cycling and skating track—and it’s still close enough to Mumbai in case anyone wants me to sing for them,” he says. How can I contact Mr Nigam? May I please get an email ID or a number please. I am his 60 yr old fan & want to just send him my gratitude & blessings! He has both talent & a good heart! God bless. Many thanks! Hello Sonu Da ap kaise hon? And all the Best of U.. King Ur..